Welcome to the Autumn edition of the County Jottings. Our golfing season is complete and we have had some success this year with our Seniors winning the Southern Counties Foursomes Championship at Sherborne in October. Unfortunately, in the Leagues it has been another case of close shaves as far as the County and Senior Leagues are concerned, with both teams failing to get an extra half a point in the crucial match. However, the various Junior teams have had a reasonably successful season against other Counties with the Under 16s winning their League and remaining undefeated throughout the season. The Nike Futures Tour has had a very successful second year and this programme of events will continue through 2013. We are grateful to our Sponsors – Fullers and Nike – for their support this year and for their continued support for 2013. Congratulations to all the winners of our Championship and Trophy Events, also to those who represented the County at Junior, Senior and County levels. 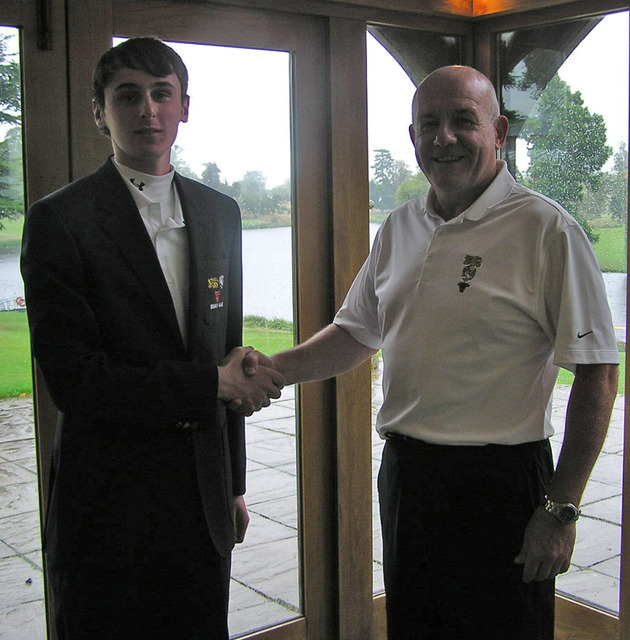 Jack Haines (Gerrards Cross) tied with Carl Corbin (Wokefield Park) for the main Order of Merit in a close run contest and George Baylis (Mill Ride) was the winner of the Junior Order of Merit. David Shaw, the Seniors’ team captain, has decided to stand down from his post. Our thanks go to David for his hard work and dedication over the past six years. He will be succeeded by Malcolm Reid, a County Captain. The work of the Golf Partnership continues with the Academy Coaching programme for this year now at an end. Recruitment days have been held to identify the junior players with potential who will go forward into next year’s programme. Needing just a draw against Essex to be almost certain of winning the League, we came up ½ point short at Romford on 9th September. Once again just ½ point could see the difference between winning a League and coming second. This time at Romford we got off to a poor start against Essex and trailed at lunch 1-3. Nonetheless we felt we could still pull off an escape and despite losing the first 3 games in the afternoon we were still in with a shout right until the end but we never quite closed it out. 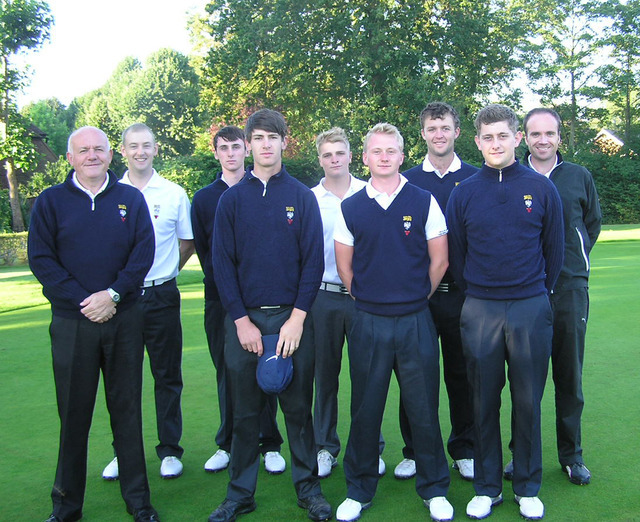 To win the League we had to beat Hertfordshire in the re-arranged match at Brocket Hall on 23rd September. The team at Romford: James Foster (Newbury & Crookham), David Langley (Castle Royle), Andrew Lynch (Stoke Park), Joe Richardson (Frilford Heath), Max Smith (Newbury Racecourse), Oliver Tite (Witney Lakes), Ashley Walton (Frilford Heath), Ashley Watkins (East Berkshire). The re-arranged match against Hertfordshire was played at Brocket Hall on 23rd September. Again this was a tightly fought contest, with 6 games going to the last hole and narrow margins in the remaining games. Herts won 7-5 and yet again League success and failure has been decided by the narrowest of margins. In fact the BBO finished with more game points than the winners Essex but obviously with fewer match points. All in all it was not a bad effort from a side with no full time golfers or players in the national set up. What was apparent across the year was that our stronger players struggled a bit against the stronger players from other Counties but our strength in depth meant our players in the lower order picked up points. James Foster earned his colours having played in five league matches. The team at Brocket Hall: Carl Corbin (Wokefield Park), James Foster (Newbury & Crookham), David Langley (Castle Royle), Andrew Lynch (Stoke Park), Malcolm Reid (Sonning), Joe Richardson (Frilford Heath), Oliver Tite (Witney Lakes), Ashley Watkins (East Berkshire). We played our second friendly match against Wellington College on 6th October at East Berkshire which resulted in a draw 4-4. 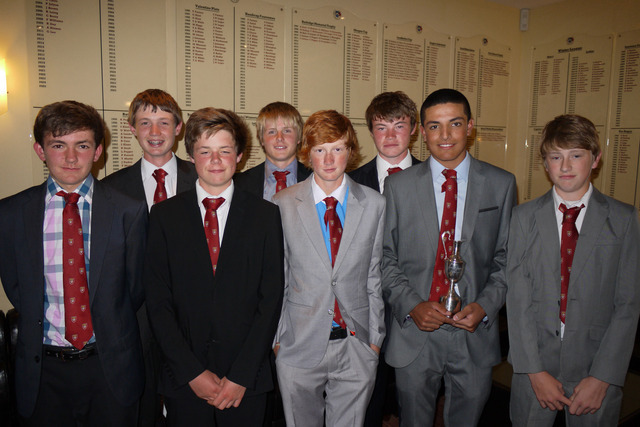 The Under 16s took on Surrey in the annual match sponsored by 'The Mugs', played at Huntercombe on the 28th August. An excellent performance in the morning foursomes was followed up with a strong series of singles games and we eventually won 11-4. This makes the score 10-9 in our favour over the 19 years the match has been played. The team at Huntercombe: Patrick Bart (Burnham Beeches), Sam Bower (Burnham Beeches), Dylan Brownlie (Castle Royle), Zac Cooper (Beaconsfield), George Gardner (Castle Royle), Chris Little (Frilford Heath), Will Preece (Chipping Norton), Alex Nicholls (Goring & Streatley), Max Nicholls (Newbury & Crookham), Elliot Wills (Beaconsfield). The 3rd League match was against Bedfordshire and Hertfordshire at Welwyn Garden City on 20th August. An excellent win against Bedfordshire 7½:4½ and an exciting draw with Hertfordshire means we have an excellent chance of winning the League for the first time. The team at Welwyn Garden City: Patrick Bart (Burnham Beeches), Sam Brass (Castle Royle), Zac Cooper (Beaconsfield), George Gardner (Castle Royle), Chris Little (Frilford Heath), Alex Nicholls (Goring & Streatley), Max Nicholls (Newbury Racecourse), Elliot Wills (Beaconsfield). The Under 16s completed their League season at Pavenham Park on 30th August with a whitewash of Middlesex and a narrow victory over Bedfordshire, winning the League for the first time. The team at Pavenham Park: Patrick Bart (Burnham Beeches), Zac Cooper (Beaconsfield), Michael East (Burnham Beeches), George Gardner (Castle Royle), Chris Little (Frilford Heath), Alex Nicholls (Goring & Streatley), Max Nicholls (Newbury Racecourse), Elliot Wills (Beaconsfield). The Under 14s completed their League season at Ashford Manor on 23rd August with a big win against Middlesex and a narrow victory over Hertfordshire. Hertfordshire win the League on game points difference. 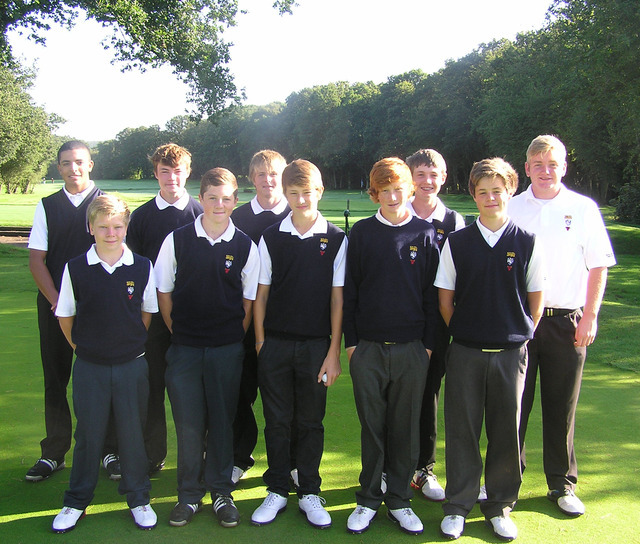 The team at Ashford Manor: Harry Baldock (East Berkshire), Harry Bowness (Newbury & Crookham), Charlie Brown (Castle Royle), Matthew Cradock (Witney Lakes), Michael East (Burnham Beeches), John Gough (Stoke Park), Jordan Holden (Winter Hill), Sebastian Jones (Castle Royle), Thomas Kane (Woburn), Callum Kirby (Harleyford). We played a friendly against Surrey on 13th October at Wellington College unfortunately losing out to a stronger team. The team at Wellington College: Harry Bowness (Newbury & Crookham), Charlie Brown (Castle Royle), Matthew Cradock (Witney Lakes), John Gough (Stoke Park), Ross Hampshire (The Oxfordshire), Sebastian Jones (Castle Royle), Jack Kennedy (Wexham Park), Tom Kane (Woburn), Callum Kirby (Harleyford), Harry Powell (Calcot Park), Steven Stanhope (Frilford Heath), Ryanpal Ubha (Beaconsfield). The race for the Order of Merit Trophies resulted in a first win of the year for Ross Hampshire from the home club and the 6th win of the year for Nick Elmey (Drayton Park) on an autumnal day at The Oxfordshire on 31st October. Despite Nick's record number of wins on the Nike Tour this year, he was not able to overtake Steven Stanhope (Frilford Heath) in the Order of Merit. With Steven's 4 wins and 3 second place finishes on the Tour and his win in the Under 12s Championship, he just crept into the top spot finishing just over 3½ points ahead of Nick in the best 9 from 12 format. In the Under 14s Order of Merit an extremely close finish saw Zac Cooper (Harleyford), Elliot Wills (Beaconsfield) and Michael East (Burnham Beeches) all in with a chance of taking the title. Michael just squeezed in by the narrowest of margins with Zac finishing second and Elliot in third place. 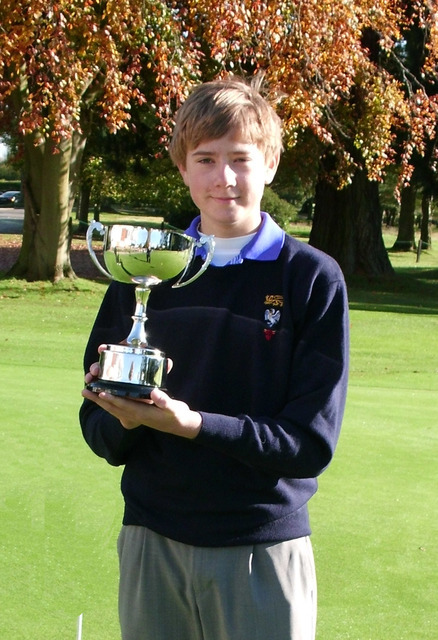 Jack Haines (Buckinghamshire) successfully defended the Autumn Trophy over 28 holes at Harleyford on 21st September. Due to extreme slowness of play, with many groups taking between 4½ and 4¾ hours to complete 18 holes, the Committee decided that there was no chance of all the players finishing in daylight and therefore curtailed the second round to just 10 holes. Chris Little (Frilford Heath) finished just one shot adrift and Marc Grimsey (Harewood Downs) a further shot back. On a lovely Autumnal day at Temple on 13th October Maidenhead got the better of Sonning in the Hillman Trophy Final. They got off to a flying start and soon had a 2 points advantage after winning the first 3 games but losing the 7th quite heavily. With Maidenhead dormie 4 in game 4 it was not long before they closed this one out to get the 4 points need for victory. With games 5 and 6 producing a win for both Clubs, the overall result was 5-2 to Maidenhead as they won the Trophy for the 3rd time having had success in 1993 and 1997. Maidenhead: Stuart Greenfield, Andy Hing, Nigel Horbury, John Pulford, Barry Stone, Duncan Thomas (Captain), Jim Watson. 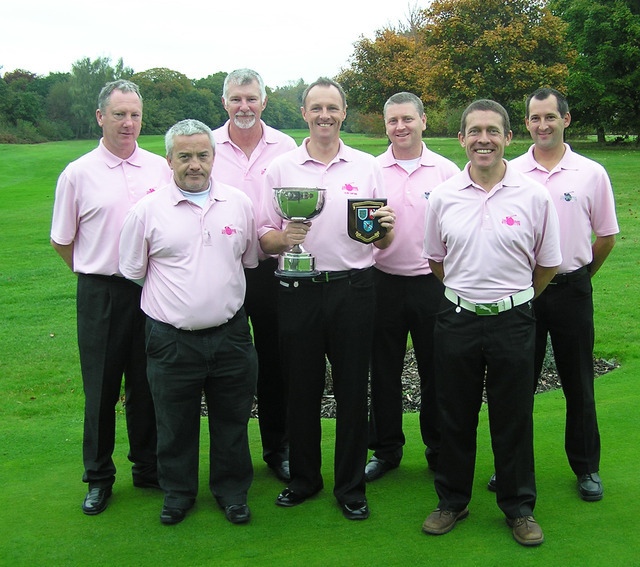 Sonning: Keith Avenell, Andy Bebb, John Connaughton, Gareth Edwards, Sean Hill, Richard Shillito (Captain), Mark Thompson. Thorney Park overcame Harewood Downs Artisans in the Final of the Hillman Trophy Plate at Burnham Beeches on 21st October. Both teams were in their first Final but there were not many signs of nerves as the contest got underway. Most of the games went down to the wire but it was Thorney Park who got the better in the close matches and took the Trophy 5½-1½. Thorney Park: Dave Goff, Tony Jones, David McJannet, Tyson Pickett, Mark Towner (Captain), Colin Verrall, Steve Wincott. 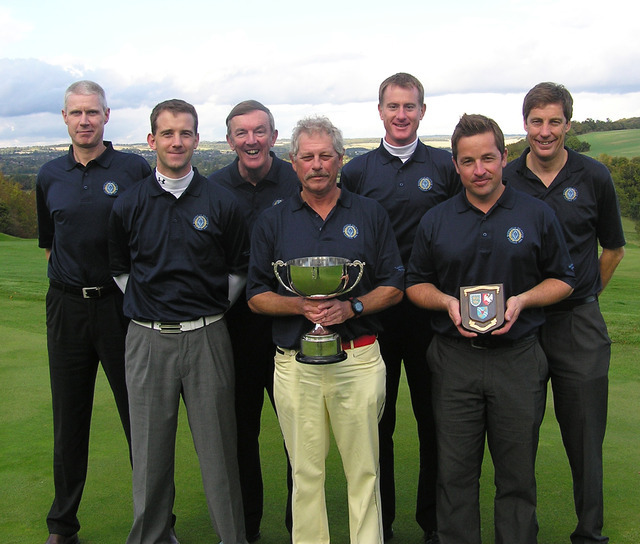 Harewood Downs AGC: Brian Bradshaw, Tony Cooke, Allen Ginger, Tony Jeffrey (Captain), Andy Porter, Chris Sharp, Colin Smith. In a nail biting finish to the Order of Merit, 4 players were in with a chance at Harleyford on 21st September in the final event of the year. Going in to the Autumn Trophy, Carl Corbin (Wokefield Park) held a 6½ point lead over Ashley Watkins (East Berkshire), a 7 point over Alex Lodge (East Berkshire) and an 8 point lead over Jack Haines (Buckinghamshire). Any number of permutations was possible but, for any of the others to win, Carl had to finish outside the top 6 at least. With all the players in the last 2 groups it was not until the complete scores had been entered that it transpired that Carl and Jack had tied on 37½ points with Ashley in 3rd on 35 points and Alex 4th on 34½ points. 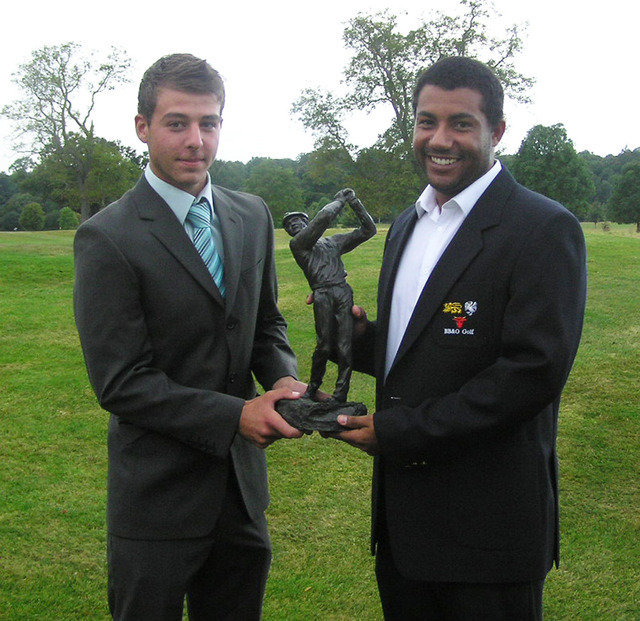 With no rules in place for a countback to decide the winner the Trophy was awarded jointly to two outstanding players. 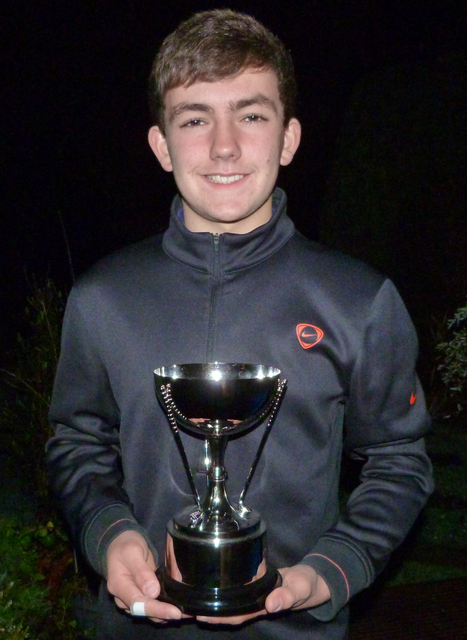 Congratulations to George Baylis (Mill Ride) after an outstanding year in Junior Opens, he won the Junior Order of Merit by a long way with David Langley (Castle Royle) and Luke Fitzpatrick (Stoke Park) in joint second place. 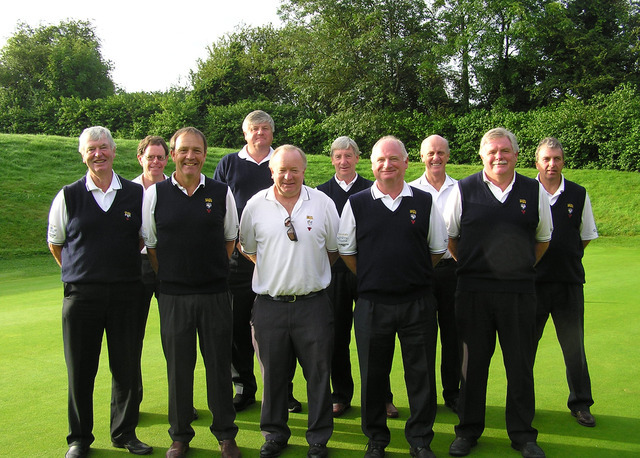 The Seniors played Surrey in the Semi Final on the morning of August 14th at Hockley GC near Winchester. We played well to achieve a 4½-½ win. The other Semi Final was between Hampshire and Sussex which Hampshire won 3-2. We looked forward to some revenge over Hampshire who beat us last year at Hankley Common and we were not disappointed as we won 4-1 in a series of tight games. 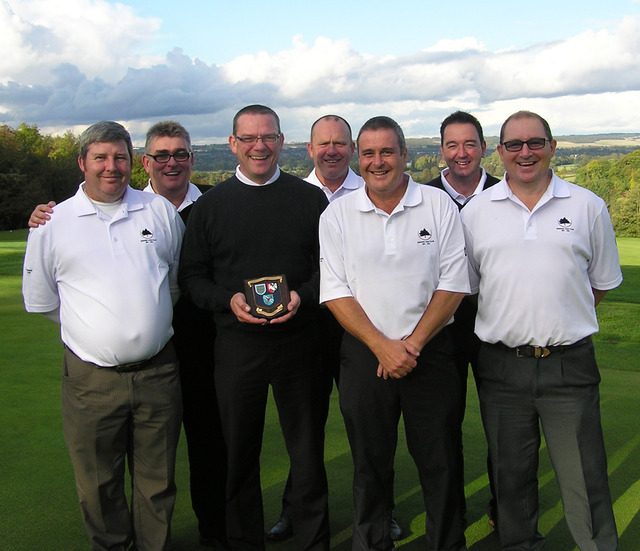 We then went on to Sherborne in October to play the winners of the 3 other Group Sections. The team at Hockley: Ashley Brewer (Denham), Rod Crisp (Ellesborough), Adrian Donkersley (Gerrards Cross), Bob Lander (The Lambourne), David Lane (Goring & Streatley), David Niven (Newbury & Crookham), Cliff Pearce (Ellesborough), Gilbert Runnicles (Gerrards Cross) Phil Sewell (Castle Royle), Steve Webb (Henley). 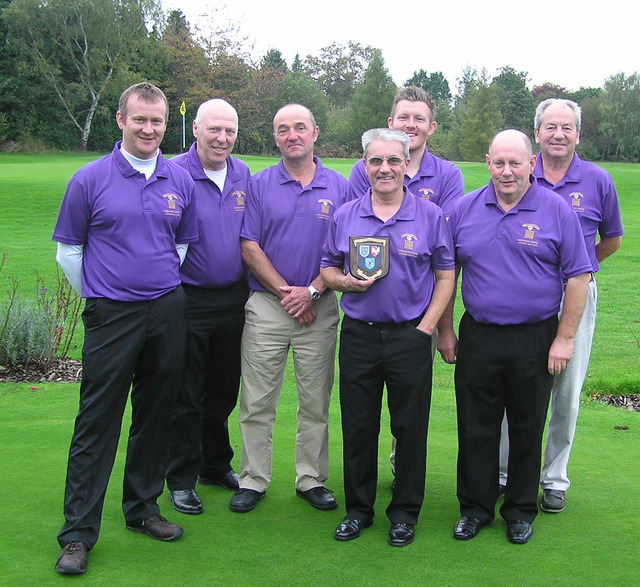 The Seniors finished their season in style by winning the Southern Counties Seniors at Sherborne on 21st October. The four finalists from the Preliminary Rounds were BB&O, Suffolk, Gloucestershire and England County Seniors Champions - Hertfordshire. We were drawn to play Hertfordshire in the morning semi final and were determined to make up for our narrowest of defeats in the League and in the County Qualifying at Moor Park in June. Much discussion over dinner resulted in a change of our batting order as we tried to second guess the Hertfordshire strategy. They must have had the same thoughts as we ended up playing the same people - just in a different order! As predicted we lost games 1 and 3 but compensated with good wins in games 2 and 4. It was all down to the last game and we went down the last 1 up. A half would be no good as the tie break formula would give Hertfordshire the win. Rod Crisp and Gilbert Runnicles were not looking too good after the tee shot, but a good recovery and excellent 3rd shot saw them reach the par 5 in regulation and 2 putts were good enough to win 1 up. We took on Suffolk in the final after lunch and with the weather closing in we had to finish after 11 holes. We were well ahead and the end result was about right at 3½-1½. This was a fitting end to David Shaw's tenure as Seniors’ Manager and we thank him for all his hard work over the past 6 years. The team at Sherborne: Ashley Brewer (Denham), Rod Crisp (Ellesborough), Adrian Donkersley (Gerrards Cross), Bob Lander (The Lambourne), David Lane (Goring & Streatley), David Niven (Newbury & Crookham), Cliff Pearce (Ellesborough), Gilbert Runnicles (Gerrards Cross), Phil Sewell (Castle Royle), Steve Webb (Henley). David Niven won the England Golf South Eastern Seniors Championship at Felixstowe Ferry on 26th September. 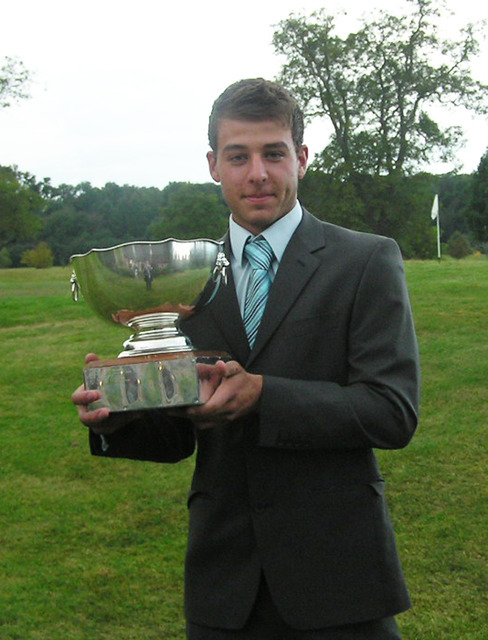 He led by 1 shot from John Ambridge, a recent England International, after an excellent 74 in terrible conditions. The second round was abandoned after torrential rain (makes a change in 2012) and the result declared on the first round score. Duncan Forbes (Sonning), our President Elect, won his age group with an excellent round of 79. As defending champions this was always going to be a tough act to follow as we went to Sandford Springs on 22nd/23rd August. None of these matches are easy and we opened up against strong Kent and Hertfordshire teams. In very close games 4 of the 6 results were halves and a win a piece, resulting in 2 drawn matches. Not a bad start, but could have been better. The afternoon we were up against Sussex and Surrey and another 3-3 draw against Sussex was offset with a 5-1 win against Surrey. We were still in with a chance of retaining our title but Essex and Hampshire were ahead of us at the half way mark. The next morning we played Suffolk and Hampshire and had a good win against the former but lost to Hampshire 5-1 just coming up short at the 18th on 2 occasions. Middlesex and Essex were next and despite a valiant effort we could only muster a win against Middlesex and a draw with Essex who took the title with Hampshire second and us in 3rd place. A great effort and as it transpired one missed putt on the last green in the last match was the difference between 1st and 3rd. A turnout of 50 attended the Half Year Council Meeting on 24th October. The President, Max Kaye, highlighted the achievements of the year. After the meeting the delegates enjoyed the hospitality of Sonning Golf Club with Peter Smith and Keith Chantrey from Donnington Valley winning first prize in the Greensomes event.